His dad took him fishing. Salt water trout. They were walking by the water on Livebeck Island, Clapboard Creek, near Cedar Point and New Berlin. The day was gray and flannel-shirt cool. November. Wesley was 14. He crouched toward the mud and pulled out an encrusted old bottle and showed it to his dad, who told him to throw it back into the mud. But the mud was full of secrets and usually it demanded great patience. This time, however, it had reached up toward Wesley and handed him an artifact of weathered glass. He took it home. He hid it from his father, showed it to his mother. They hadn’t caught any fish. This old bottle he brought home instead. His mother put the bottle on the mantle over the fireplace. After that, everywhere he went, he looked for old bottles. Any kind of bottle he could find—liquor bottles, beer bottles, milk bottles. He brought them back from fishing trips and from long hikes in the mosquito-swarming woods. He salvaged them from trash piles and creeks and the eternal North Florida marsh. He imagined the whole trajectory of their coming to him from the moment they were made, and he saw all these trajectories as time-rivers that converged old glass upon him. His mother took the china out of her old oak china cabinet so Wesley could display his bottles there. 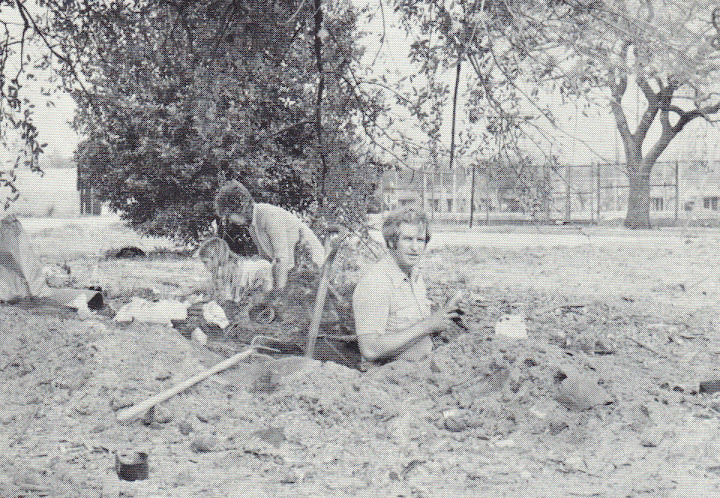 In his early twenties, he was an expert at locating old trash dumps, and in his head he carried a map of their interspersions all over Duval County. He talked about a place downtown where he found 30 black glass whisky bottles dating from the residence of a prohibitionist preacher. He said the places in back lots where outhouses once stood frequently held the remains of bottles, china, toys, and other garbage. He became expert in finding the places that no longer were. He knew where outhouses typically had been located and he looked for certain discolorations of the soil beneath the grass and weeds. He knew where all the old bottle dumps could be found. Some of those underground collections of beautiful glass are lost now, and his knowledge of the whereabouts of those collections is lost as well. 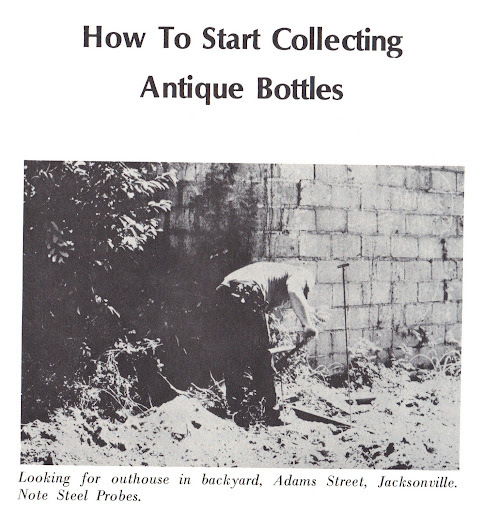 He knew the bottle dumps in White Springs and St. Augustine and Fernandina Beach and Fort George Island. Wesley bore the yellow flies and mosquitoes and horseflies and ticks and put his shovel into the ground in the spiderwort and air potato vines behind the 1820s slave quarters at Kingsley Plantation on Fort George Island. He knew about a dozen old garbage pits filled with bottles around downtown. Elsewhere along Hogan’s Creek from the Springfield marsh dump the old woman had shown him, he found whisky and gin bottles mixed with bottles for Keeley’s Cure for Drunkenness. 1) At Bay and Liberty Streets, a small empty safe buried 10 feet beneath the ground. 2) At Duval and Ocean Streets, clay pipes, arrowheads, Civil war minié ball, Indian pottery. 3) Somewhere on Church Street, a small child’s skull, a partial plate of gold bridgework, debris from the 1901 fire that destroyed most of the city. 4) At Adams and Catherine Streets, between 40 and 50 pieces of china from the Windsor Hotel, pre-1900. In the late 1960s, when he was in his mid-20s, Wesley bought an old filling station in Riverside near a boundary with Murray Hill. It didn’t look much like today’s service stations. Just as movie theatres were built as “movie palaces” in the 1920s, thousands of gas stations were built in naïve forms of the architectural styles of the big houses of the 1920s and 1930s and 1940s. The Pure Oil Service Station was built in 1937 in adaptation of the so-called Tudor Revival style that flourished in Florida between 1900 and 1935. Tudor Revival houses featured half-timbering in upper stories and rooflines, purely ornamental, unlike in the original structures built in England in the 1500s. These Ye Olde English houses were always ersatz, even if they’ve gained some beauty and authenticity by now just by lasting through the decades, but a Tudor-style Ye-Olden gas station screamed kitsch. Especially one with a grand chimney. Imagine a roaring fire stoked in a gas station on a Florida winter night. Wesley saw the kitsch. He saw the kitsch, the campiness, and he loved it. He was onto it, and so he enhanced it by painting the cross-timbering, the rooflines, the doors, the visible structural beams purple. He painted them all purple. Before he bought it, the service station building had housed a thrift shop called the Barter House. 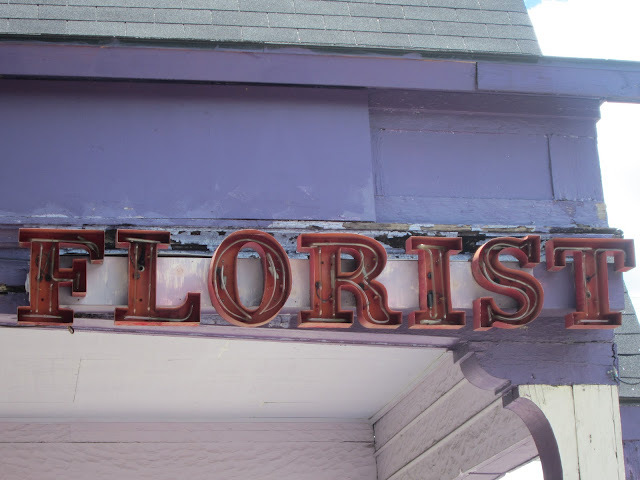 Wesley and his wife Anne used the building for their business, Algonquin Antiques and Auction Galley, “Free Appraisals on Antique Bottles.” But the kitsch of the building called to the whimsy in Wesley, and the couple converted the building into a florist’s shop. They called it the Purple Petunia Antique Shoppe and Flower Shop. The older women who grew up in Riverside Avondale in the 1940s and 1950s but moved out when it began to decline in the 1960s and 1970s always came back to shop in the 1970s and 1980s and they always stopped in at the Purple Petunia. 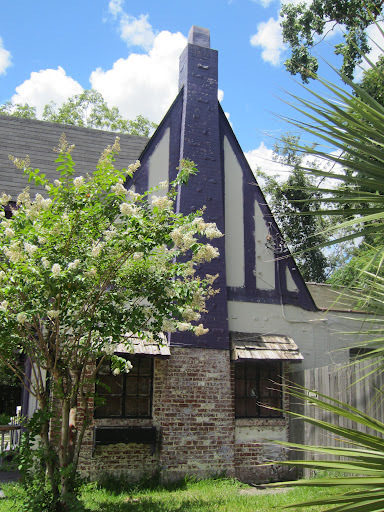 The gay couples who began to move into Riverside in the 1970s and 1980s and heralded the renovations and artistic turnaround of the neighborhood always stopped in at the Purple Petunia. By the time Wesley died in 1994, the gay bar next door called The Norm was one of the most prominent gay hangouts in a large conservative town. Twenty years after Wesley died (his epitaph says, “A Big Man with a Big Heart”), the purple paint persists, but the Purple Petunia is gone. 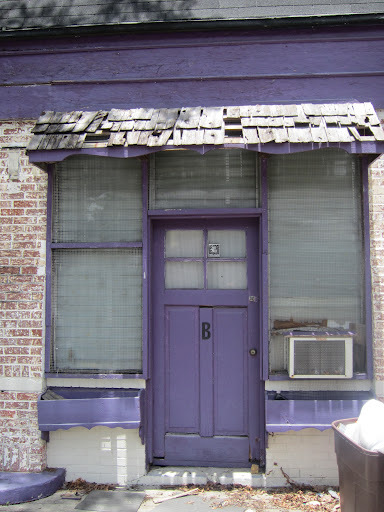 At least, the shop called the Purple Petunia is gone. 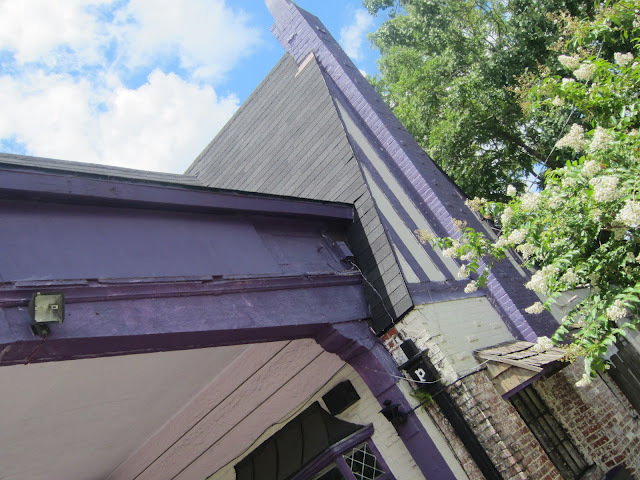 Neighbors still call the building the Purple Petunia, though it’s been boarded up for several years. He loved to look at the sunlight moving through the earthy colors of the old glass bottles on the shelves of his windows. He loved the aquas, the blues, the greens, the purples.